Lab members Shelby, Jenna, Lauren, Geena, and Kyle attended the 89th annual meeting of the Midwestern Psychological Association from April 20-22 at the Palmer House Hilton in Chicago. The purpose of this program is to share research across all areas of psychology, featuring lectures, poster presentations, discussion groups, and social events where psychologists and students can discuss their research and interests. 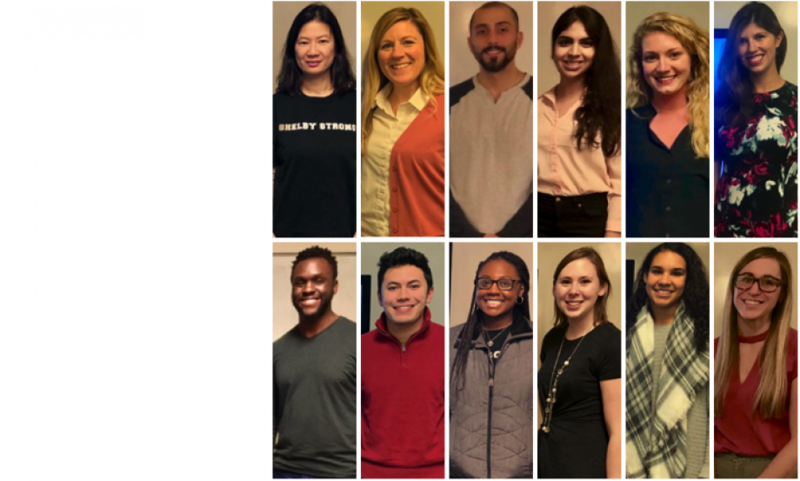 The program consisted of almost a thousand research presentations, as well as workshops and programs offered by Psi Chi, the Society for the Teaching of Psychology, and the Society for Community Research and Action. Lauren presented her poster titled, Are Narcissism and Posttraumatic Growth Correlated in College Students? which she worked on with Matt, Shelby, and Dr. Taku. Geena and Kyle presented their poster titled, Is Religious Value Associated with Resilience in a Sample of Christian Adolescence? which they worked on with Whitney and Dr. Taku. Religion was a popular topic at the conference and many people came to talk to them about their work! Shelby and Jenna also presented their poster titled, Social Support and Resilience: Predictors of Self Esteem in Adolescents, which they worked on with Geena, and Dr. Taku. The conference was quite successful with over 2,700 people in attendance. The PTG Lab looks forward to attending the 90th meeting next year!